I hope that the news of India’s Mars Orbiter Mission which launched into the Mars orbit today is making a lot of good noise around the world. It makes me feel very proud. Although I have not been following it all that keenly, but now that the mission has made such a splash with its success, let’s do a quick round up of cool facts about the mission. The spacecraft is also called Mangalyaan, which literally translates from Sanskrit or Hindi as ‘Mars Craft’ or ‘Mars Vehicle’ (‘Mangal‘ or ‘Mangala‘ = Mars, ‘Yaan‘ = craft, vehicle). Wikipedia explains further about the astrological connotation of ‘Mangala‘. The Indian Space Research Organisation (ISRO) hence joins the inner circle, so to say, being one of only four space agencies (U.S, Russian & European) to achieve this feat. India is the first country to successfully send a Mars orbiter in it’s maiden attempt. The orbiter was launched from the Sriharikota launch centre on 5th Nov. 2013 and completed the orbital insertion today, 24th Sept. 2014. 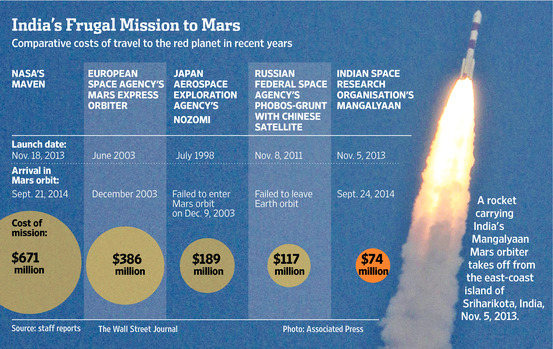 At $74million, it is by far the cheapest Mars mission ever. Checkout the comparison depicted in the picture below which is doing the rounds on all news sites. As pointed out by PM Modi, this is quite a few dollars less than the $100million Hollywood movie ‘Gravity’. Way too cool, I must say! Find out all you need to know about this mission & from these very knowledgeable sources: The Wall Street Journal & Wikipedia, and more about the Mars missions over time. It is indeed a proud moment, however the cost comparisons can be deceptive, India’s mission is just very basic…but still its a great achievement at such low cost. I do agree with you Peter, the scale is different if you compare with that of other space missions, but it is an achievement nonetheless. i am pleased you are pleased, but i can’t help but wonder about this indian government spending priorities.lets just say if i had so much poverty, and social injustice, in my country, sending a craft to mars would not be anywhere near the top of my list. Hi Vanillarock, I am aware that many share your opinion that India’s space mission might be misplaced in the bigger scheme of things. However, I do believe that a ‘show’ of potential / power is sometimes a great boost to a nation’s collective pride in itself. If anything, it makes me more hopeful of a progressive future for my country on all fronts. Thanks Dalo! Man has come such a long way, right? From believing the world is flat to reaching up to other planets!! It is pretty amazing to think about the time of my Grandparents versus what we have today… Cheers! Hi Bipasha! I went through your blog and must say it is different from many other blogs I have read. I am a relatively new blogger and would love it if you could go through my place in cyberspace!! !